I’ve decided that I love soft, chewy cookies compared to those hard, crunchy ones. Cookies are so versatile and I love all the variations that can be done. 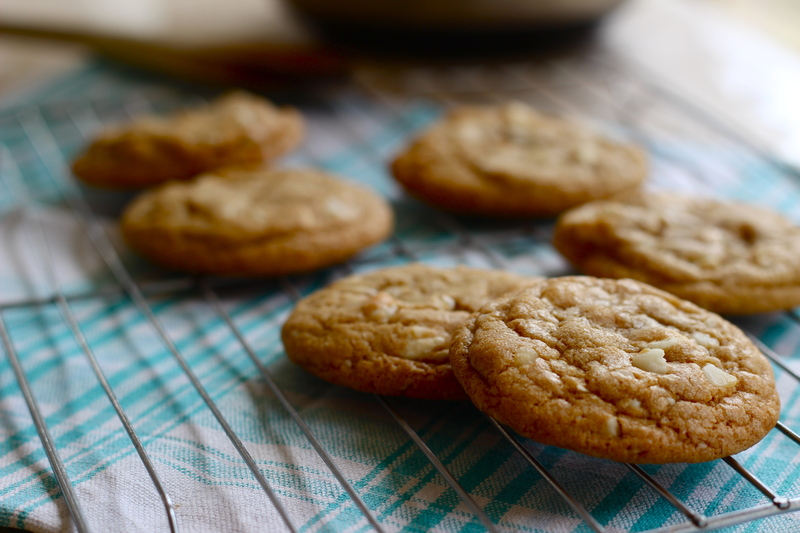 I’ve made white chocolate chip and macadamia ones today. A winner combination in my books 🙂 Other great combos you can do with this recipe are peanut and dark chococate, walnut and milk chocolate chip and hazelnut and milk chocolate chip cookies. So have a play with recipe if you like! These cookies don’t need much time in the oven. Cooking them for short amount of time means they are soft, chewy and delicious! The best thing to do after taking them out of the oven, is to leave them on the tray for 10 minutes because they will continue to cook slightly and then transfer to a wire rack to cool. Make sure you try one while they are still warm because there’s nothing better than a warm cookie! If your like me, I’m constantly trying the mixture of my baking at every stage just to make sure it’s ok 😉 so sometimes I lose quite a bit of the mixture before they get to the plate to give to family and friends. Combine the flour, baking soda, cornflour and salt in a large bowl and set aside. In another bowl, whisk the melted butter and sugars together. Then whisk in the egg and vanilla. Pour the wet ingredients into the dry ingredients and mix together with a large spoon or spatula. The dough will be very soft and thick. Fold in the macadamias and chocolate chips. Cover the dough and place in the fridge for at least 2 hours. Remove dough mix from fridge and allow to sit at room temperature for 15 minutes. Preheat the oven to 160°C and line 2 large baking trays with baking paper. Roll the dough into balls. I made mine about 2 tbs in size. Bake for 12 minutes and after removing from the oven, leave on trays for 10 minutes before moving them to a wire rack to cool completely. I like them soft too, they look yummy Mel.